Google has released a new Analytics update that will be very useful for tracking your campaigns accurately. 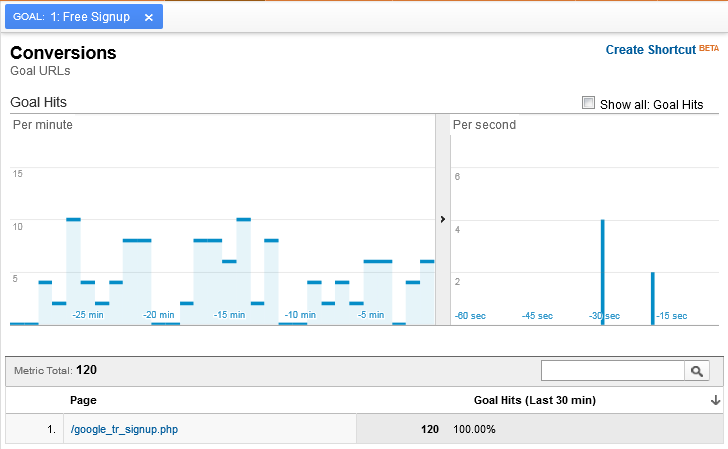 Google Analytics now features real-time goal conversion tracking. This new feature will allow you to see short-term conversion trends and drill down on converting pages as your various goals are hit. It’s a great addition to the current real-time tracking tools on Google Analytics, and an important tool for your SEO campaigns. The new real-time conversion-tracking tool features two live bar graphs that show all conversion activity occurring in your site in real time. One graph shows goal hits per minute, covering a total span of 30 minutes; one shows activity per second, covering a total span of one minute. The bar graph format makes it easy to spot how high the converting activity is on your site and see short-term conversion trends. Below these graphs, you will see a table containing a list of your goals and what percentage of your total goal hits each goal contributed over the past 30 minutes. 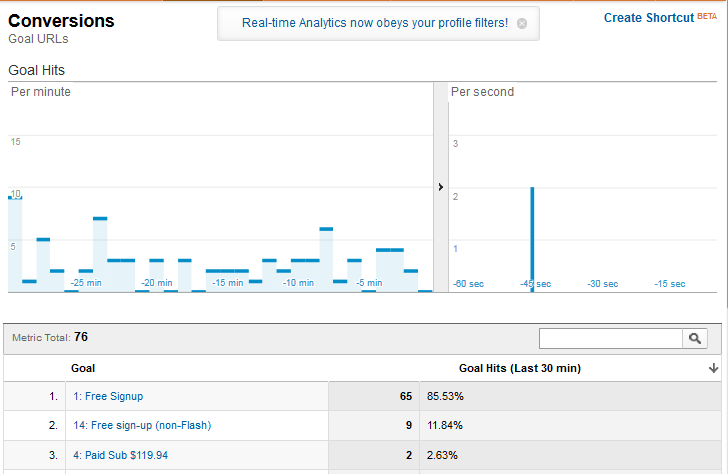 You can click on each goal individually and drill down your converting pages. You will see how many people have completed a specific goal. Seeing how many conversions take place in real time is very useful, especially when you are checking the effectiveness of your marketing strategies and improvements in your converting pages. The real-time information, combined with data from other sections of Google Analytics’ real-time tracking, will let you analyze the behavior of your target market more accurately and make adjustments on the spot. Having a more accurate profile of your audience lets you develop more targeted campaigns. This also means you can give your clients more detailed updates during conference calls and visits to your company. With this tool, you can provide the most updated data on their campaigns and show them their performance in real time. The Conversions section of Google Analytics will continue to track long-term performance, and this data is included in your monthly executive summaries, but the live updates provide a good picture of where your campaigns are headed in between reporting periods. Contact your account manager today if you need help analyzing your target audience’s behavior using this new feature, or if you simply need assistance with setting up goals in your Analytics account. Don’t forget to sign up for free if you’re not yet our partner – we’ll help you with your marketing strategy and provide advanced SEO tools. Keep checking back for more updates!